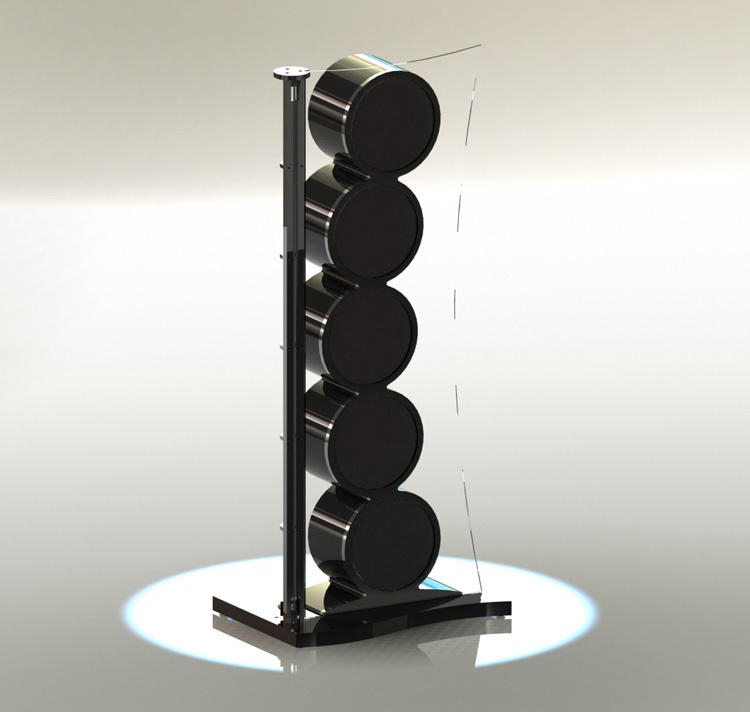 We have some great speaker designers out there. Sigma Acoustics for one with the Orchestra series, Soulsonic with his Hologram X, and other larger producers which have tried to, but have not been able to radically understand what a box design does to the sound, in and of itself. I won’t try to explain what I cannot fully comprehend here mathematically (geometrically), but what I can say is that using the same geometry in 99% of the speakers out there, shows how disturbingly STUCK we are with our box theory of what a speaker should look like. Have we ever considered that the outward appearance of the box actually makes an immense difference on the sound? I guess not from what I see out there. Designers take so much time to pick the best drivers, make a crossover – endless experiments for the best sound, and use a myriad of wonderful resources. The problem which I see today is that the “box theme” of speaker design, for some reason, has not been technologically developed as internal speaker technology has. I personally believe the industry hasn’t taken this whole-heartedly – they do not consider it matters. Why modify the looks when everyone accepts what we already have? How does one make a speaker aesthetically different from the rest, and still have mass, bloom, lifelike reproductions, realism, sound staging, depth etc with natural instruments? I guess after a few decades or countless software programs later, you can test your cabinet and the effect it has on music reproduction – after all, are any two instruments shaped the same? It is mathematics, physics and precise execution of geometrical calculations which can take you a long way, it seems. This is what I had to reflect once again today. I heard one speaker, and the same woofer with the same crossover points, in a differently shaped box design, using the same mass, sounding uncannily different. Both being aluminium. Both using the same equipment. The A/B blind comparison was so drastic that I was left very humbled by my own ignorance of the profound difference a millimetre and shape make, on the exterior alone. Here is one example: when using advanced math and geometry to modify an existing plane design, it could result in higher speed with less fuel consumption, and longer engine life. Cars and planes are all tested for air coefficient, yet speakers and music reproduction are not. This to me is a crime. We could get so much more than we do, and it is my desire to voice this concern to the designers out there because speed and timing are vital in sound reproduction. Design of a speaker changes the sound quality and as obvious as it is to me, it is obvious and equally easy for the makers to take that into consideration. 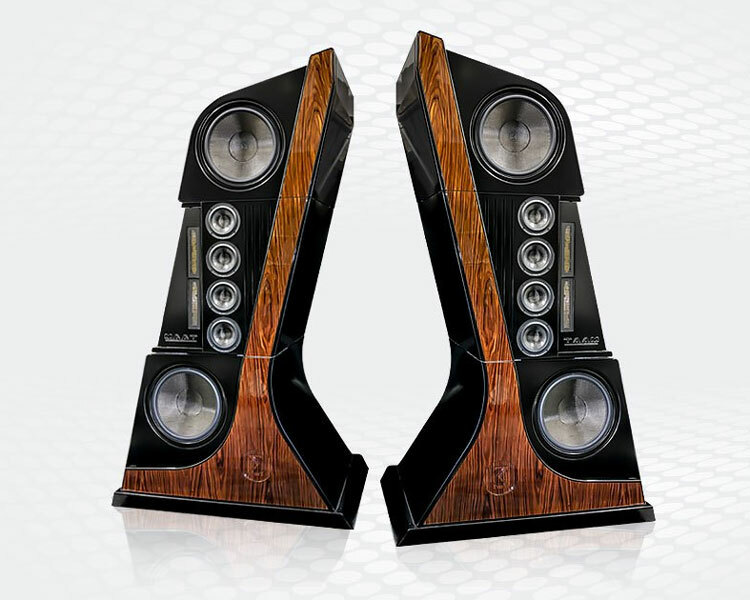 Improving speaker design is a necessary task yet only a few, other than some boutique brands, bother with it. These few companies are not trying to cosmetically induce sounds, they are fighting with sound waves using the math formulas, discerning with our ears. We, as consumers, must look at what is given to us and ask the creator why, how, and what processes were taken to achieve the ultimate with their drivers. The dipole Sigma Orchestra for example, despite the problems with ribbon tweeters, found a solution by firing the midrange upwards (while the ribbons were moving horizontally) to cancel any negative effects. This increases sound stage and makes a 100+ kilo speaker seemingly vanished. The harp strings used are not there to look expensive, but to tune or voice the speaker, and there is a tail at the end of the speaker’s edge for the music not to bounce downwards but upwards, like a car’s spoiler for example. SoulSonic Hologramm-X by Miro, on the other hand, is essentially the largest passive loudspeaker in the world with 2400mm in height. It uses the biggest single piece of ribbon on any speaker known. Every element of physics known to him is applied to create five spheres that complete the musical realm. Each woofer has its own enclosure and with a see-through material to top it off. Metaxas, meanwhile, uses every means possible to him, creates from the inside out, but takes the sonic attributes from the exterior of the speaker to a level no one in the world, at least to my knowledge, has reached before. When people ask me if these specially designed speakers play well, I only answer “why do you ask? Is it that inconceivable that we can have it all?! Looks and immaculate sound quality in the same package?” Sure, it’s a hard combo, but alas, there is living proof that it exists. The fact that Kostas Metaxas has surpassed anyone with his unique designs and taken two design awards, now going for the third, is about to get into the “Hall of fame” for his architecture in speaker and turntable/reel to reel/amplification design. So to wrap up, I will try to resonate with the speaker designers of the world, to take into account that it is not all about woofers and crossovers, but the exterior details will echo in the final sound quality. Speakers will not excel further sonically if external designs are to remain stagnate. I am keeping this simple as this article will be translated into other languages. Here I must give kudo’s to Magico for making an aluminium bodied speaker, yet with so many moving shelves on the inside it almost defeats the initial purpose of using a mono block CNC made enclosure. Resonance when deadened, is a sonic improvement, fact not fiction. Points by my technical editor on speaker design Miro has also written something on this point which is worth a read. A very careful read. During my roughly 30 years of actively designing speakers and experimentation phases and after trying out nearly every existing box loading technique, crossover topology (series and parallel or no crossover), driver working principle, diaphragm material, dispersion characteristic, enclosure material, baffle configuration, etc – I could only come to one basic conclusion: with speaker designs we are dealing with compromises – inevitably. 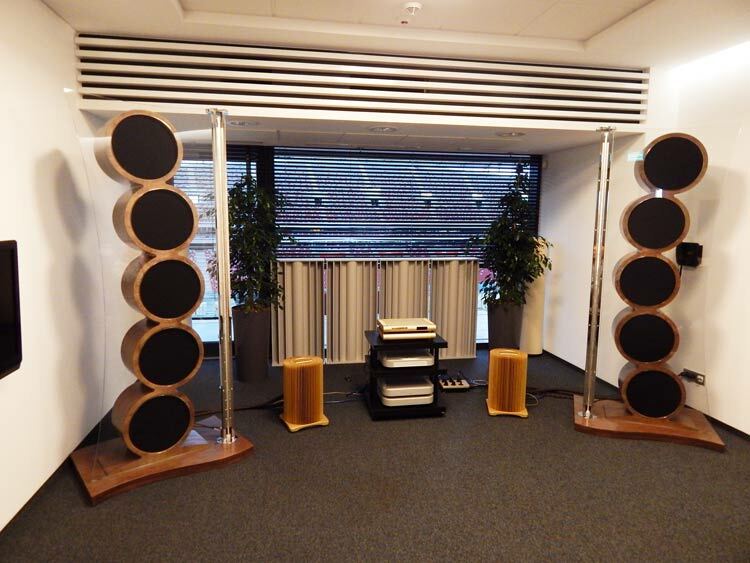 One can have strong preferences and an ear for certain speaker building approaches and resultant sound reproduction “flavors” but at the end of the day…the outcome will always be a compromise. A no-compromise speaker does not exist…well, perhaps it does, at some marketing departments. If we speak about state-of-the-art speaker design or, shall I say, attempts to come reasonably close to the original event, then we need to fulfill certain demands.I won`t touch upon nice small systems for small to average rooms that we all cherish and love (me included) but rather on the shamelessly big and bulky ones. There is much debate on whether live sound should be our reference or not, due to all the variables involved (recording methodologies and approaches) but I highly doubt rejecting it, will help us make true progress in the technology field of realistic sound reproduction. Saying: we will never be able to come close to the original event – certainly won`t help. Progress is happening in all technological fields and soon we may witness substantial improvements in sound reproduction chains due to various technology developments. “There are forms of distortion which are not often discussed as part of the standard how loud, (amplitude) how often, (frequency) questions, such as how fast or how large. In the ‘how large’ question, if we begin with a large original source, such as a symphony orchestra, which has perhaps two and one half hundred or more square feet of radiating surface, and if we then measure some total delivered radiated sound power by that symphony orchestra, and then divide that total radiated sound power by the total radiating square footage of all of the instruments of the orchestra, we derive an average energy output per square foot of radiating surface. We are essentially measuring the overall, average intensity of the sound per square foot of energy source area. Now, in playing this total radiated sound power back, in the reproduction cycle, we are typically dealing with a few square feet, two or more square feet of radiating energy surface, there has been an enormous increase of intensity per unit area of radiating surface. A simple example will illustrate the idea. We can imagine a square surface of one hundred square inches moving one quarter inch peak to peak in reproducing a 100 Hertz wave at 100 decibels. Now let us suppose that we halve the square footage of the radiating diaphragm. If we still wish to create 100 decibels at 100 Hertz, we will now need to double the excursion of that same diaphragm to hold total radiated sound pressure as a constant. Our one hundred square inch diaphragm needed to travel 25 inches each second to produce 100 decibels at 100 Hertz, our 50 square inch diaphragm will need to travel 50 inches each second to produce the same total radiated sound pressure level. It is interesting to consider what this extra distance over time will mean when expressed as a peak velocity, and what the magnitude of the increased back electromotive force will be from the amplifier point of view, expressed as a changing mix of current and voltage in phase net resistance, as a percentage of increasing current and voltage out of phase net reactance. Remember, musical instruments (contrary to majority of speakers) have big active surface radiating areas and thus, when making sound, exhibit a low surface loudness. The smaller the speaker, on the other hand, the more the sound is being squeezed and hence perceived as unnatural, forced and compressed – because of the high surface loudness effect. 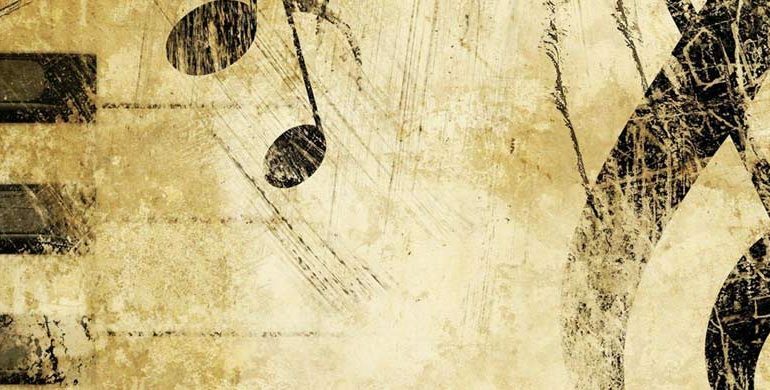 All this, of course, matters only if we put the highest demands on the music reproduction quality and if we aim to come as close as possible to the original musical event. So, how do I deal with these extremely difficult issues? Well, with big speakers obviously but it would be oversimplifying to say that big, alone, is all that matters. Without getting too deep into the details, let me just say that every speaker (regardless of the visual design) that I have ever developed, first had to meet certain acoustic design criteria and the visual design just had to follow it (the old saying: form follows function). None of my speakers were designed just for the sake of odd looks, but during the conceptual working phase I did, most likely, envisioned the final shape – at least roughly. 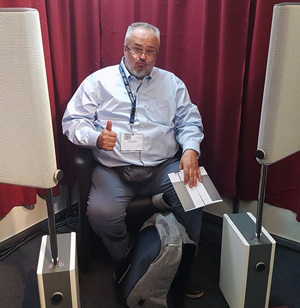 My listening impression was always that bigger AND wider speakers always sound more realistic, with more believable weight/body in the reproduction of instruments and voices. A bigger active surface (drivers) and bigger passive surface area (front baffle) certainly give more of this than a really narrow baffle. Of course, electronics play a big role here but speaker proportions matter a lot. In nearly three decades I have made hundreds of different speaker prototypes, most of them of a modest size and rectangular, boxed configuration. After building so many relatively small, rectangular boxes…I, kind of got really fed up with all these square and rectangular shapes (and their sound capabilities), to the point that would make me nervous, just by spotting them. Now that I`m older, I came to peace with them, haha. Although it is quite true we are somehow socially conditioned that when mentioning speakers, we automatically assume (most people do) a rectangular box, but…these two things are not synonymous and luckily, more and more manufacturers prove this by taking more and more freedom in creating refreshing visual alternatives that still provide all the necessary acoustic functionality. With an open mind in regard to the basic technical frame and visual basis, a sonic progress can be made that surprisingly, can unlock more aural blessings 🙂 Speaking of myself, I have had some remarkable experiences with the old Apogee ribbon/planar magnetic speakers – this was crucial in my later design orientation. Out of this first patent, all modern, pure ribbon, planar magnetic, air motion transformer and many other transducer technologies evolved. I have experimented a lot by building numerous planar magnetic and true ribbon transducers but in the end settled for the pure ribbon. While experimenting with numerous boxes and boxless alternatives, I have developed affection for the later but with this approach the size does matter. Once you strip the speaker of the box, the overall efficiency goes south, unless we are willing to accept really large baffles. This fact alone is of crucial importance if we want to drive speakers with low-wattage tube or transistor amps. Of course, open baffle speakers can have relatively high sensitivity figures if we are willing to compromise on the bass extension. To have a small, passive open baffle speaker with deep bass capability and 100dB efficiency…this is possible only on paper…and paper can support any claims. This is the reason my speaker`s sensitivity ratings are modest (realistic) – because I don`t want to fool people or myself. – The stained glass baffle enhances the overall sensitivity of the whole speaker and minimizes the dipole cancellation effect (generally: the bigger the baffle, the better the efficiency). 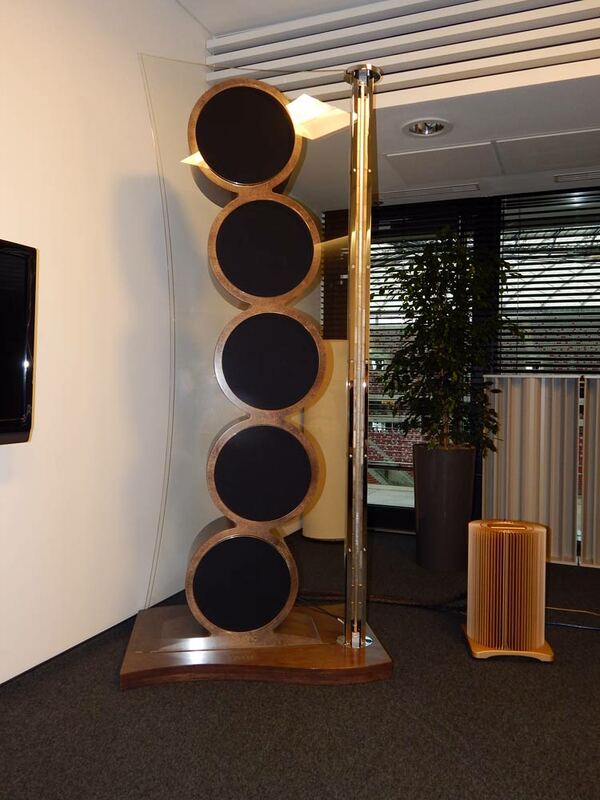 This baffle could be wooden or metal but then the speaker would be much more visually dominating. – The 12″ paper midrange is placed close to the ribbon and the 15″ woofers are placed away from the ribbon – where they should be. – The woofer and midrange enclosures are open back – cardioid dipole, meaning the air pressure flexing the cones is missing (should be a good thing). – The ribbon is the tallest of its kind in the world. The ribbon foil has an effective surface area of an 8″ woofer (roughly about 220 square cm) but weighs only a tiny fraction of it. An 1” dome tweeter has about 7 square cm of active surface area. So a really tall ribbon will have an easier job to reproduce the high frequency spectrum and this at all levels. Ideally, a true line source ribbon should extend from the floor to ceiling, this provides conditions for the acoustic mirror – theoretical endless line source. My bigger models are all pure dipoles or cardioid dipoles while the upcoming EMOTION model will be a hybrid, dipole in the the upper mid and treble range and sealed/vented in the lower midrange and bass. The reason for this is because the baffle width does not support low enough cut off frequency point and hence needs some acoustic assistance. For crossovers, I always go for the lowest possible (electrical and acoustical) order; the 1st order is my favorite but for the tweeters I use 2nd order or a displaced 2nd order – this gives me better tweeter protection and lower distortion. Basically, what determines the behavior of the transducer/speaker, is the acoustic slope/order not the electrical one (impulse response, ringing, subjective impression, etc). This means that, essentially, a speaker crossover can be 1st order electrically but the sound characteristic will be that of the summed combination of the acoustic and electric slope. A tweeter which falls off at 18dB per octave below its passband, will exhibit a 4th order characteristic with a 1st order electrical crossover. Same goes for the midrange; a driver which falls off at , say, 12dB per octave above its passband, will exhibit a 3rd order acoustic characteristic – with the 1st order electrical slope, etc. A low order crossover will always have better micro and macro dynamic response and thus will sound more realistic and less compressed than a higher order one. So these are some of the basic design traits that I have been following throughout the years. They all represent my personal views and beliefs and perhaps someone else`s too but luckily, the path to sonic bliss consists of countless roads…and it all comes down to what each one prefers instinctively.